For a wine region of France that is in many ways very traditional, apparently very conservative, Champagne is also surprisingly innovative. True, there has been the ‘grower Champagne’ revolution with many farmers who once only grew grapes now bottling their own Champagne, but even among the larger Champagne houses there is a seemingly endless string of new wines and new styles. 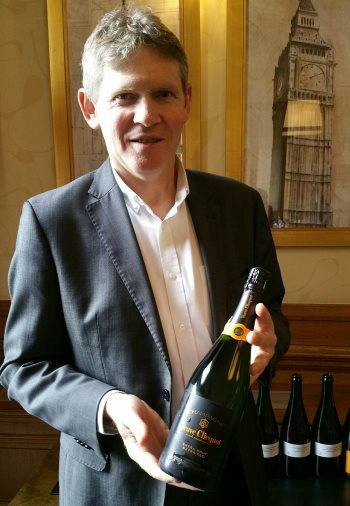 The latest, unveiled in the UK by Cellarmaster Dominique Demarville (right) in April 2017, is Veuve Clicquot’s Extra Brut Extra Old. Veuve Clicquot’s flagship is the ‘yellow label’, the Brut Champagne that on one hand is the ‘entry level’ Veuve Clicquot, but on the other is the most important wine in their portfolio: the familiar cuvée that everybody knows, and by which the house’s reputation stands or falls. Yellow label is a non-vintage Champagne, that is, each bottling is based on the harvest from a particular year, but will also contain significant proportions of wines from earlier harvests. At time of writing the Yellow label that is on the market in the UK is based on 2013 harvest for example, but that is only 52% of the blend: wines from 2012, 2011 and 2010 make up around 35%, wines from 2009, 2008 and 2007 a further 10%, and the remaining 3% comes from vintage 1999 – an 18-year-old wine that has been held in tank for almost two decades. This blending of non-vintage Champagne is essential not just for the Cellarmaster to be able to maintain a consistent house style (a hedge against the vagaries of weather in northern France which means consecutive years can produce very different fruit profiles), but the addition of older wines also adds depth and character. Veuve Cliquot holds over 400 different wines in ‘reserve’ for this purpose: different varieties, vineyards, and from 17 different harvests. All are kept at low temperature in stainless steel or concrete tanks, on their lees, slowly gaining some toast and buttery richness in the process. Dominique first had the idea for ‘Extra Brut Extra Old’ in 2011: the wine is an extension, or a different interpretation, of yellow label, partly a reflection of just how important their bank of reserve wines is to the house: it too is a non-vintage wine, but with much more importance given to the reserves. In fact, it contains only reserve wines. No component will be less than six years old, with a minimum of three years in tank plus three on the lees in bottle before disgorgement. This first release is composed of six vintages: 2010, 2009, 2008, 2006, 1996 and 1988. It is also bottled with a sweetening dosage of only 3g/l as opposed to yellow label’s 9g/l, making it Extra Brut rather than Brut. Finally, it is bottled at lower pressure of 4.5 bars as opposed to 6 bars, which I found added to the wine’s vinosity: the sense of it being a serious, food wine. A limited number of bottles and magnums will be released, with some retail availability in specialist wine stores. To celebrate the launch, Dominique has also shipped over six samples of the reserve wines from the same vintages used in this first release, so that we could taste the qualities that wines spanning almost 30 years could bring to a blend – though he stressed that the very old wines, which can add volume and toasty richness, must always be used sparingly to ensure they do not dominate or overpower. Notes below on the current bottling of the Yellow label and on the new Extra Brut Extra Old, followed by brief notes on the six samples of reserve wines. Extra Brut Extra Rare will have a recommended retail price of £69 per bottle. (2017) This Yellow label release is a 2013 base along with reserves from 2012, 2011 2010, 2009, 2008, 2007 and 3% from 1999 making up almost 50% of the blend. It's always great to stop and think about such a familiar wine as Veuve yellow label, and realise just what a good wine it is. This has delightful autolysis, a touch of biscuit and light floral notes, which move elegantly on to a palate that's beautifully orangey and fresh, those nutty notes still there, a creamy but light mousse and fabulous clarity of acidity. Drinking beautifully. Widely available at around £40 - £45. From the Marne region and 1er Cru village of Ville-Dommage. Lovely toast, green flecked and figgy but crisp and aromatic. Lean and taut, lots of green apple and citrus. From one of the prime Pinot Noir Grand Crus, Aÿ, also in the Vallée de la Marne. Nutty and fine, the racy floral notes and lots of apple freshness. Juicy orange acidity and a fuller-bodied mouth-feel – but delicate. From the 1er Cru village of Villers-Marmery, this bears the hallmark of a great vintage with hugely impressive concentration and intensity of both aroma and flavour: a tight touch of baked apple, but so vivacious and vibrant, great power and length. Another Grand Cru, this one in the Montagne de Reims. Gorgeous autolytic depth, toasted wheat and nuttiness, gingerbread even, the elegant round fruit so fresh, a citrus pithy core of acid. “Not a Grand Cru or 1er Cru but a wonderful place for Pinot Noir,” says Dominique. Slightly less pure, a touch cheesy, but loads of creamy depth of texture and a warmth, finishing cut apple fresh. From a famous Grand Cru for Chardonnay in the Côte des Blancs, a beautiful pure and clean nose, gentle floral nuances and crisp apple fruit. A bit of sesame seed toast, butter and creamy sweetness to the fruit before shimmering tight lemon acids still present.